If you’re looking to automate decisions across any sector, you should consider Sparkling Logic. Sparkling Logic’s products let business analysts model, test, simulate and deploy decisions in operational systems and processes. Business analysts can define business rules, derive logic from data, and measure a decision’s impact using the organizations KPIs and metrics. 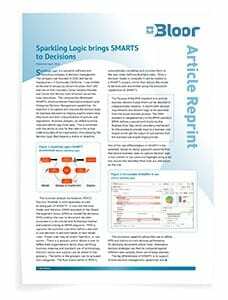 Read Bloor’s report to learn how Sparkling Logic’s SMARTS Decision Manager and PENCIL Decision Modeler can make your decisions smarter.